We signed our lease for our apartment sight unseen. I remember visiting our new place the day I interviewed for my first real job. After an eleven hour Greyhound trip from Hell from DC to New York, I got into New Haven after sleeping at a friend’s apartment in Midtown Manhattan and catching the first Metro North I could an hour before my interview the next morning, shedding exhausted tears. But after I did uncharacteristically well in front of my future bosses (I still think I somehow deceived them), our friend took me to this place we had only seen through her eyes and in terrible photos on Craigslist. I gave the realtor our security deposit and first month’s rent and asked if I could look at the apartment. It was being painted, she said, so no. But the realtor left me to my new-lease-reverie and my friend, being bolder than I, marched right in and started taking pictures. I remember being somewhat unimpressed by the place. The carpet was schoolroom blue and the whole place needed a good paint job. I opened a set of doors looking for a bedroom only to find a closet. At least the bathroom was big. A month later, after we drove our UHaul from DC at the end of the summer and spent a few days in limbo, Chris and I finally got to see our first real names-on-the-lease, not-an-illegal-sublet place together. The carpet was gone, replaced by beautifully repolished wood floors. New white paint gleamed by the light of a lovely light fixture in what we decided we would make our dining room. We arranged our thrifted furniture and finally got a bed frame from Ikea. 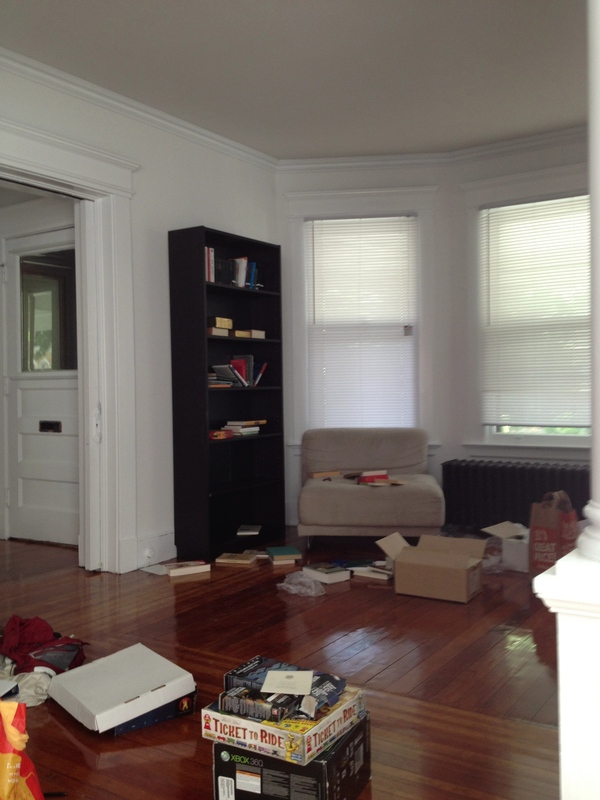 We moved in, if somewhat gradually. It was ours. We brought Christopher home here eight months later to new, gifted baby furniture. 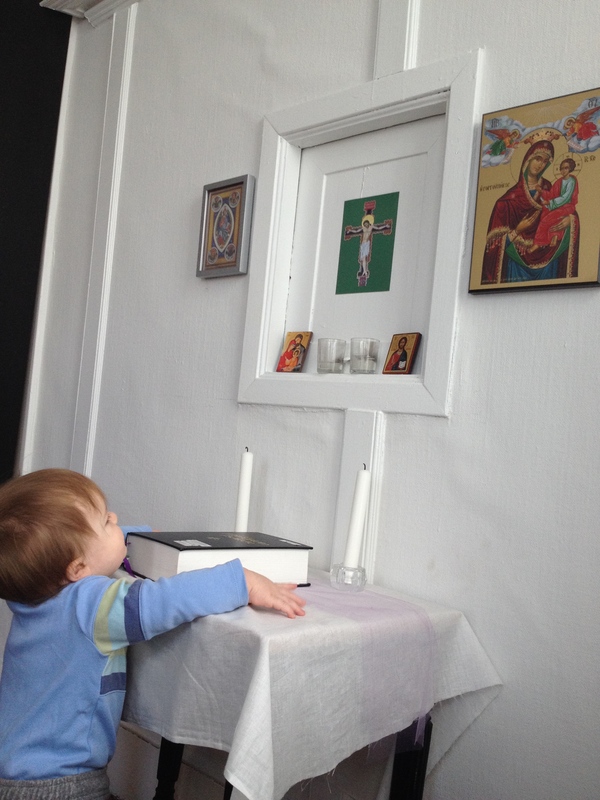 We set up our prayer corner. We slowly added our own touches. And now we’re moving. Just a few blocks, but to a completely different arrangement. Our new place is a basement apartment without an oven or a stovetop. It has carpet instead of those gleaming hardwood floors. But we prayed hard for this new place and we can’t be more excited to move in. 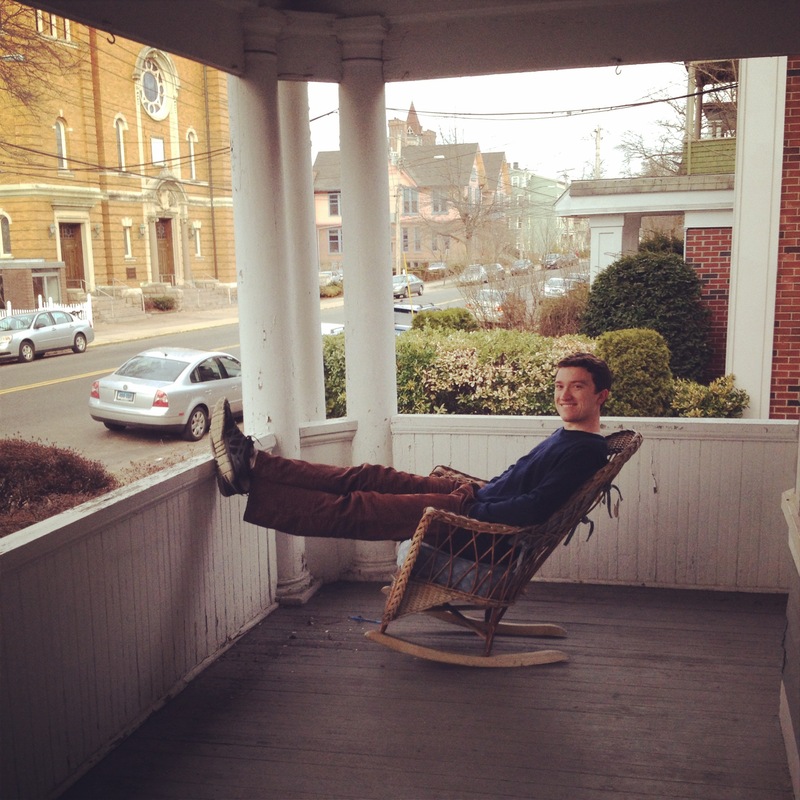 You see, it’s a basement apartment of a rather large house on the nicest street in New Haven. We won’t pay rent or utilities. In exchange, we will be taking care of the owner’s Norfolk Terrier, Chester. “Dogton Abbey,” my mom named it and so it shall be. Grad school can be expensive and, by God’s grace, it hasn’t been the past two years. But with a funding change next year, we needed this place. It seemed like a dream. No rent? I didn’t even want to consider the option for a while for fear of disappointment. But things started moving, friends started praying, and we are moving in this summer. Life will still be full of, well, thrift, and a lot more dog walking – a treat for the baby whose only word currently is “woof” – but we’ll finish this step of the academic saga with a lot less debt. We know this place will be just as joyful as our first lovely home.